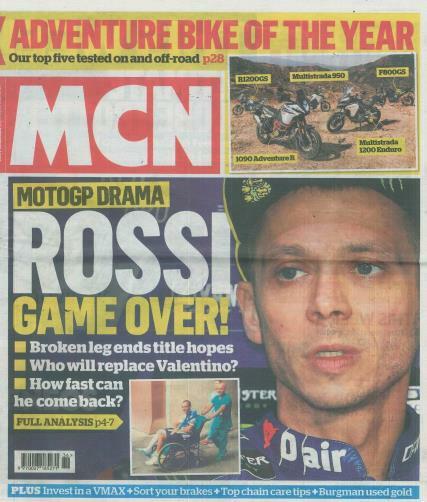 MCN (Motorcycle News) every week delivers all the road and sports news for every biker, from commuters to Grand Prix racers. Buy a single copy or subscription to Motorcycle News magazine. If you want to know what's happening on Planet Motorcycle and how it affects your wallet, enjoyment, knowledge or rights, then Motorcycle News (MCN) tells you first. It brings you the best of biking every week. It’s the biggest motorcycle media brand in the world and has been at the heart of motorcycling since its launch almost 60 years ago. It continues today to deliver a constant feed of the best motorcycle news, reviews, world exclusives, first rides, road tests, sport, respected opinion and expert advice. Each week Motorcycle news magazine (MCN) delivers all the road and sports news for every biker, from commuters to Grand Prix racers. Cant get enough! Quickly dispatched.